Can each tab have a different CookieSwap profile? Does this work with Facebook? I can't find the CookieSwap menu in Firefox 4 or later! Is there a toolbar icon so I can hide the Status/Add-on Bar? CookieSwap for Firefox4, Firefox5, Firefox6 published! CookieSwap is a Firefox web browser extension/add-on. If you have multiple logins for web based e-mail accounts (like Gmail, Yahoo! mail, Facebook, etc), then CookieSwap enables you to easily switch between those different accounts by creating multiple "profiles" that can be easily changed which will 'swap' the 'cookies' that the sites use to know you. Check out the CookieSwap Firefox Add-on Page. The CookieSwap menus are in the Nagivation Toolbar and the Status Bar (A.K.A. the 'Add-On Bar') of the Firefox browser and lets you quickly swap profiles. For more information on customizing the CookieSwap toolbar icon see this page. Changing your cookies/identity to web e-mail sites (like Yahoo, Gmail, Hotmail, etc) so that you can quickly look like different users. Nice if you maintain multiple e-mail accounts and are tired of logging out and then back in to switch accounts. Also nice if two people are using the same computer and want to switch between accounts quickly. If you design web sites, you can setup numerous cookie profiles to look like different types of users and swap between those users quickly and easily to test your site in numerous modes (you can hand edit the cookies to have distinct values in each profile using a nice extension like 'Add & Edit Cookies'). NOTE: CookieSwap does NOT store your username/password anywhere. 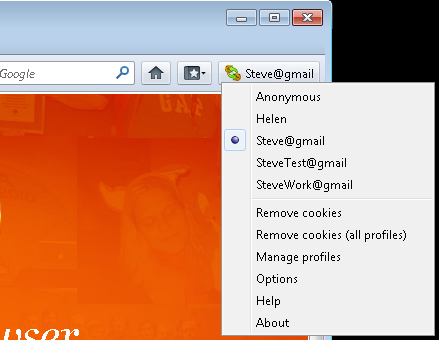 Instead CookieSwap keeps the "cookies" that are stored in the browser that tell the web site who you are. This means CookieSwap works with any web site (Yahoo, Gmail, Amazon, Facebook, etc). There are numerous sites out there that do a great job explaining cookies (like Cookie Central), but from my prospective they are just little pieces of information that web sites store on your computer/browser to identify you. Sometimes they are nice (when you tell web sites like Yahoo, Hotmail, Gmail, etc to "remember you" so that you don't need to login every time you visit the site) and sometimes they are bad (since they allow web sites to "track" your activities at their sites and other sites). Often, users want to delete cookies (using the cookie manager or a nice extension like 'Add & Edit Cookies') and setup privacy settings for cookies (using another nice extension like 'CookieCuller'). CookieSwap does not try to replace these extensions, but instead it allows you to temporarily change out all your cookies to quickly change your identity to web sites. Back in 2005, I created this extension to solve the problem my wife and I were having with our web based e-mail accounts. My wife and I use the same computer in our kitchen and we both have web e-mail accounts (Yahoo!, Gmail, etc) and every time I sit down at the computer, my wife is logged-in to her account. I end up logging her out and then I login. She experiences the same thing when she then sits down. We tried a few solutions to allow us to both be logged in to our own web e-mail account at the same time on the same computer (like multiple OS logins, etc) but none proved to be ideal...enter CookieSwap. By creating CookieSwap, I finally had a solution that enabled me to sit down at the computer, "swap" to my CookieSwap profile in the browser and ...BOOM, now I'm logged-in to my Gmail account. My wife sits down and swaps to her profile and BOOM, now she's logged-in. Please let me know if you think this type of extension would be useful to you, either in the ways I've explained above or in some other manner that I haven't considered. Please send ideas to the mailing list(CookieSwap@mozdev.org) or directly to me via the Contact Info link on the left...thanks! -Creating blacklist/whitelist rules for which site's cookies should be swapped and which ones should be kept across all profiles. -Support publishing cookies to a site so that they can be synced across numerous machines used by one user (not sure if this is even a good idea) -Any suggestions?